The planet Mars passed by the planet Neptune to the south of Neptune by 0.02 ° on 1 January 2017 at 07 hour GMT. Magnitude of Mars was +0.9 while Neptune's was only +7.9. The set of the MRO-MARCI Weather-Report images on 18 January 2017 (λ=301°Ls) shows that a dust disturbance significantly governed around an alluvial-like fan area of Eos. As precursory phenomena, Ophir had looked dusty on 16 January and some northern spot inside Chryse proved locally dust disturbed on 17 January. This series repeated the rise and fall of the disturbances until around 29 January or so. Note that the south is upwards. The Martian Dust Disturbances still continue to occur. On 22 February 2017 at 22:39 GMT (λ=322°Ls), Efrain MORALES, from Puerto Rico, detected a significant dust disturbance near at Auroræ Sinus on the early morning side. According to the MRO Marci Weather Report, the first precursor is spotted on 20 February near at Idæus Fons. 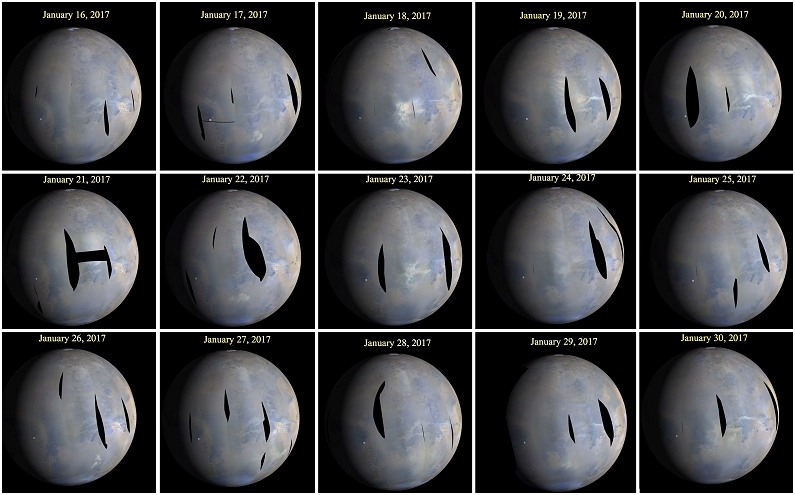 Here we show the set of images made by MORALES compared with the MRO-MARCI images on 22 and 23 February.